Simple yet highly addictive, Disgaea DS is an updated portable version of the classic Strategy RPG Disgaea: Hour of Darkness, previously available on the PlayStation® 2 computer entertainment system. Since its release Disgaea has won over a loyal following of fans that have grown to love the quirky humour and deep, long-lasting challenge. 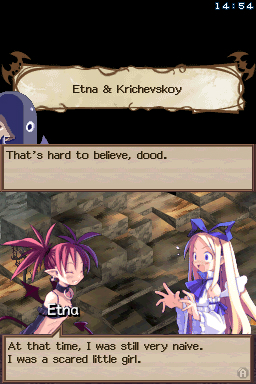 Disgaea DS doesn’t just let you take the Disgaea madness on the road, but introduces exciting innovations such as the new duel system multiplayer, complete with masses of customisable rules and game options. You’ll also be able to connect to your friend’s Nintendo DS to swap and share items, take your battles to a new strategic level with Geo Cubes and there’s an added exclusive new story mode dedicated to Etna and her quest to become Beauty Queen Ultimate Overlord. The story takes place two years after the death of King Krichevskoy, the ruler of the Netherworld. His son Laharl slept for two full years, unaware of his father’s death, while demons fought for supremacy over the Netherworld. With the help of his vassal Etna and her underlings, the egocentric, megalomaniac Prince Laharl fights his way to become the next king.